CNN is planning to bring disgraced former New York governor on as a commentator to replace the leaving Campbell Brown- thus condoning the criminal actions of Eliot Spitzer which he has never admitted or atoned for after using his influence to avoid prosecution. Interesting, because Davis writes for a website that employs conservative propagandist James O'Keefe, and he surely didn't atone for his criminal actions and he barely admitted to any wrongdoing despite pleading guilty - he claimed he would do it all over again and promised to continue. 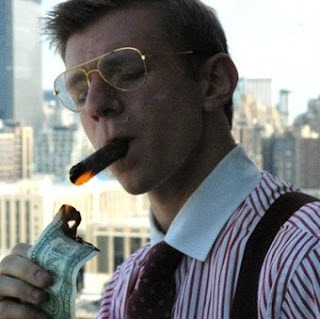 Well, I have found something else interesting about James O'Keefe - he had violated Title 18, Section 333 of the United States Code, which states that "whoever mutilates, cuts, disfigures, perforates, unites or cements together, or does any other thing to any bank bill, draft, note, or other evidence of debt issued by any national banking association, Federal Reserve Bank, or Federal Reserve System, with intent to render such item(s) unfit to be reissued, shall be fined not more than $100 or imprisoned not more than six months, or both." Looks like he is purposefully destroying American currency, and according to John W. Shoen of MSNBC, O'Keefe is costing the government money. One big reason the government takes a dim view of destroying or defacing currency is that it has to replace it; it costs money to make money — about a nickel per note. And the demand for dollars is huge. The Bureau of Engraving and Printing produces 37 million notes a day with a face value of approximately $696 million. 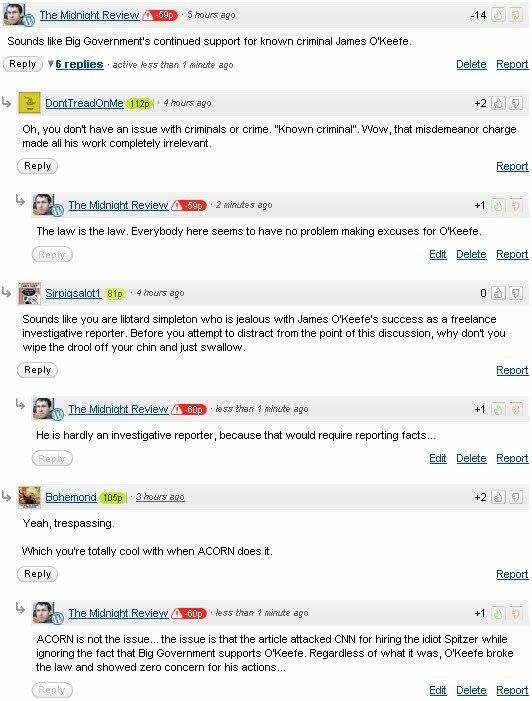 It may not sound like much, but a law is a law, and O'Keefe seems to have no problem breaking them. So, Kristin Davis. 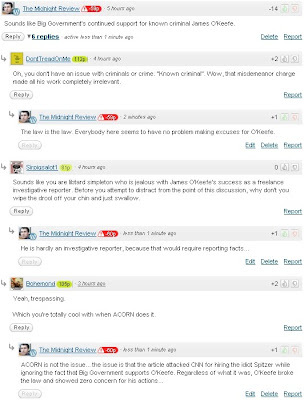 Do you plan to come out against Andrew Breitbart and Big Government for their support of known criminal James O'Keefe? 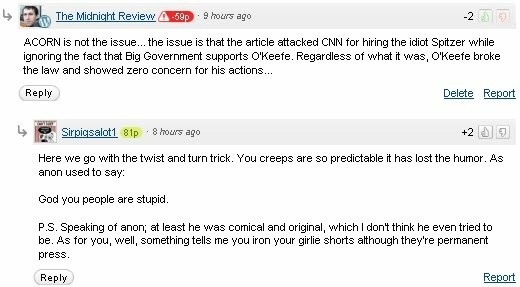 Update - I decided to post a comment on big Government pointing out the hypocrisy, but instead of being thanked, I was attacked. 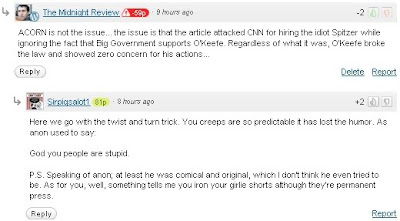 Because Big Government is famous for allowing supporters to flame critical comments, I decided to take a screenshot of my comments and the responses (Big Government is also known for deleting comments critical of their articles). Do you think Big Government will delete these comments?